From March, 1984 to November, 1985, the third Lupin III television series aired on Japanese television, for fifty episodes. 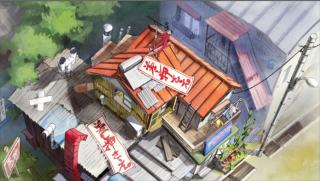 While it had the same basic set up of the previous shows, with the Lupin gang looking to pilfer treasures and property, but had a very different look and tone. For one, it was a very 80s anime, with pastel colors (Lupin wearing a pink jacket, thus the nickname "The Pink Jacket Series"), more angular character designs, characters with bigger hair, and a more contemporary soundtrack. 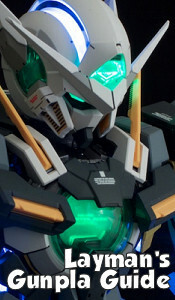 And it emphasized the more casual, laid back, but still very silly elements of the franchise. Frankly, I don't care much for it. Lupin has always been a balance between James Bond and Bugs Bunny, and the Pink Jacket show, and the movie whose aesthetics match, Legend of the Gold of Babylon, was too far on the Bugs side of the spectrum. 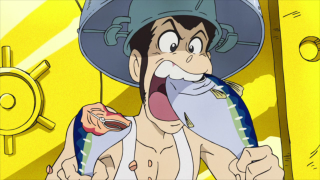 Sure, Lupin has always been a bit of a face-pulling clown, but I felt there was a little too much jaunty slapstick, at least in the half dozen episodes I've seen. But maybe that's because it was like that every week, instead of just now and then. Ocassionally, that sort of tone can be refreshing, especially for one-offs that come off the heels of a story arc. And that's exactly what "Lupin vs The Smart Safe" does, taking us into the very over-the-top realm of Part III, if just briefly, but not outstaying its welcome. And while it's my least favorite episode of Part V so far, I'd watch it again. 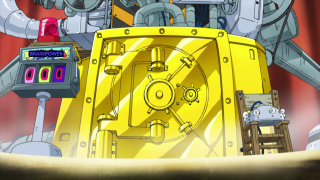 One of the silliest concepts in my recent memory of Lupin, the golden safe that can only be opened by an idiot (with a brain level of 0) is the challenge our favorite sideburned swiper faces. Now I don't think that "brain power level" is quite the same as IQ, since if you had a zero IQ, you'd be a corpse. I'm pretty sure a bottle of aspirin has at least a 7 IQ. I'm guessing that, while an idiot, the older of the two brothers (or at least the tallest) has at least the bare minimum IQ to be allowed to operate big boy scissors. Still, this is a Pink Jacket episode, so in the spirit of Part III, maybe it's best not to analyze it. Part II got absurd, but rarely as much as this. 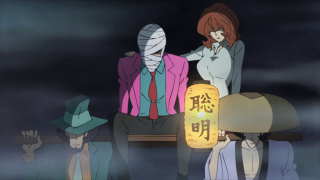 It was rather cruel of Jigen and Fujiko to basically try to beat the smarts out of Lupin. I think if you cause somebody's intelligence to lower by physically assaulting them, you're probably not a very good friend. It's not like they even need to do that to make him dumber, they could just show him the programming on E! and that ought to do it. If Lupin suffers any dementia in old age (not that Lupin III ages), it's their fault. 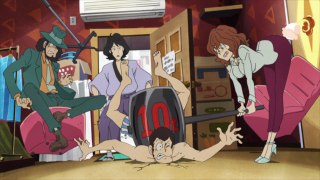 Though with Lupin's insistance on getting naked with Fujiko, maybe she can't be blamed too harshly. Jigen's just being a douchebag, but I guess the trademark tooth ache can make a guy cranky. 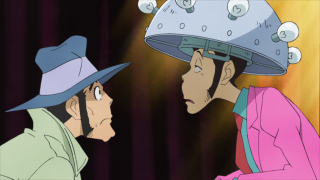 When being beaten stupid doesn't break the safe's seal, Lupin's ultimate solution is fairly creative. After all, there's no reason why he has to play by the brothers' rules. He just cranks himself up to 11 and it screws up the computer. All things considered, the older brother seems pretty pleased Lupin succeeded. He was doing a better job inspiring Lupin than his own gang. And things ultimately worked out for all parties (well, except the bank manager, though at least the stuff inside the safe didn't get stolen, and Zenigata). Also, I didn't know blueback fish had fatty acid that could make you smarter, at least so quickly. Kind of sounds like a bunch of hooey, but this is a modern episode of Pink Jacket Lupin, after all. I'm not a fish eater, myself, I leave that to my penguin friends. It looks like we might be entering another long-term story arc next week, with Lupin back in the blue and interacting with a character from the promos who has a connection to his past. I hope it's not like the various previous partners and/or rivals he's had in past entries. That got old after a while.